Use this guide if you are looking for trench maps or other military maps of the First World War. You may find it useful to look at maps alongside written records about First World War events, strategy and operations. This guide also includes brief outlines of how the systems of map sheet numbers and grid references work for maps of the Western Front. The National Archives holds many thousands of military maps from the First World War period. Many of them are official maps made by or for the British government and armed services. Others are foreign maps that were acquired and used by the War Office. Some of our First World War maps are held as separate record series of maps. Others form part of operational records or other files. Some of the maps are annotated or show other signs of use and wear. Most of these records are not viewable online. To view records which are not online you will need to visit The National Archives at Kew or pay for research. Other archives and libraries also hold some First World War military maps. See the section on maps held elsewhere. You can search Discovery, our catalogue, to locate some document references to maps. When searching, bear in mind that some maps are catalogued in much less detail than others. Most maps that form part of operational records or other files have not been catalogued individually. In some cases, the best way to search for maps that have been catalogued individually is by map sheet number. You may need to use an index map to identify relevant sheet numbers. A useful tip is to include the phrase AND (map OR plan) after the other words that you are searching for. You can use the advanced search option to restrict your search to specific record series mentioned in this guide. Alternatively, you can browse these series. Read Discovery help for more general guidance. The record series WO 153 contains maps showing the progress of the war in various parts of the world. Many of these are printed maps with manuscript annotations. Restrict your search by date to the relevant year or years. WO 297 for the Western Front. A useful index map is available in the reading rooms at The National Archives and in Peter Chasseaud’s Topography of Armageddon (Lewes, 1991). Other index maps are in WO 297/1-56. Most of these maps are individual sheets. Try searching our catalogue by sheet number or place name. Restrict your search by date to the relevant year or years. Alternatively, browse the relevant sections of the catalogue using the ‘browse by hierarchy’ option. For guidance on searching for trench maps of the Western Front by sheet number, see the separate section below. Many war diaries in WO 95 include printed or hand-drawn maps and plans to illustrate the text. These maps and plans are not noted individually in the catalogue. For guidance on searching for war diaries, please see our guide to British Army Operations in the First World War. Some maps were taken out of the war diaries after the war for the use of the authors of the Official History of the Great War. These are now among the maps in WO 153. War diaries often refer to specific locations on maps by grid reference (for example, R20 b 8.5). See Appendix 3 for more information on how the grid referencing system works. If there is no map in the war diary itself, you can search our catalogue for one within record series WO 297 or WO 153. Unless the war diary specifies the map sheet number as well as the grid reference, you may need to check the index map to identify the relevant map sheet. 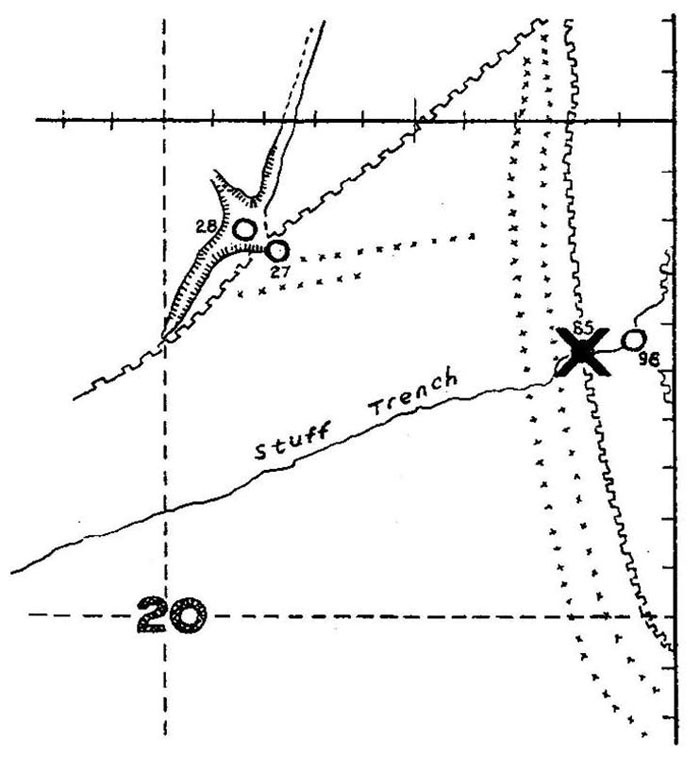 See Section 7. on how to find trench maps by sheet number. Catalogues of printed War Office maps from the First World War period are in WO 401/5-10. Searching for a 1:10,000-scale trench map covering a specific area involves several stages. Use the index map in the reading rooms at The National Archives to find the relevant sheet number. The sheet number will look something like 57C SW 3. See Appendix 2 for more information about how the sheet numbering system works. The index map is not very detailed. You may need to look for the names of nearby towns. If necessary, look at a modern printed atlas or modern online map first to work out the approximate position of the area that you want. You can search the catalogue for the sheet number. For instance, search for “57C SW 3” AND “WO 297”. (The search may not work correctly without this spacing and double quotation marks.) It may be helpful to sort your search results by reference or by date. Alternatively, you can browse the relevant portions of the catalogue: WO 297/513-1661 and WO 297/6543-6649. There is also a typescript index in the reading rooms at The National Archives. Choose the map with the nearest available date. Look for the words ‘trenches corrected to’ in the catalogue entry. If you want a map that shows both British and German trenches, look for a catalogue entry that includes ‘(S)’ (for Secret Edition) or ‘Lines A/G’ (for Allied and German lines). Once you have ordered the correct map, it is not normally difficult to understand. Most of the 1:10,000-scale maps include keys to the symbols and abbreviations used at the bottom of the sheet. Sometimes there is more information on the back. For most of the war, German trenches are marked in red and Allied trenches (where shown) are marked in blue. From July 1918 onwards, the colours are reversed: German trenches are shown in blue and Allied trenches in red. Use the COPAC catalogue to find maps in the collections of some major UK research libraries. Facsimile reproductions of some trench maps have been published in paper form. A selection is available from The National Archives’ bookshop. Copies of these maps are also available in the reading rooms at The National Archives. High-quality reproductions of some First World War maps are available from The National Archives’ Image Library. Most of the larger-scale maps showed the German trench systems in detail but not the British trench systems. ‘Secret’ editions of some maps were produced from September 1915 onwards. These showed the British trenches in detail too. Many maps at the scales of 1:40,000, 1:20,000 and 1:10,000 were made according to a common sheet numbering system. The relevant parts of France and Belgium are divided in large numbered rectangles, each measuring about 20 miles west-to-east by 12.5 miles north-to-south. Each of these corresponds to a 1:40,000-scale map sheet. Sheets covering France only are given a two-figure number followed by a letter. Sheets covering Belgium only or parts of both countries are given a two-figure number. Examples of 1:40,000 sheet numbers: 36, 57B, 62C. Each 1:20,000-scale map sheet corresponds to a quarter of a 1:40,000-scale sheet, indicated with the letters NW, NE, SW or SE. Examples of 1:20,000 sheet numbers: 36 NE, 57B NW, 62C SW.
Each 1:10,000-scale map sheet corresponds to a quarter of a 1:20,000-scale sheet or a sixteenth of a 1:40,000-scale sheet. These sheets are distinguished with the numbers 1-4. The shaded areas in the diagram above correspond to the 1:20,000 sheet 28 NE and the 1:10,000 sheet 28 SW 3. Sometimes ‘combined sheets’ were produced, covering parts of two of the ordinary sheets. Examples include: 36 NW 2 & NE 1, 57D SE 1 & 2. Many 1:10,000-scale maps have titles (which are place names) as well as sheet numbers. For example, sheet 28 SW 3 is also called Bailleul. These sheet titles are not currently included in our catalogue entries. Maps at the scale of 1:5,000 and some maps made at the other scales did not correspond to the sheet numbering system. Instead, these maps have titles, which are listed in our catalogue. These sheet titles are often obscure, Some of them refer to operations or battlefield features. Examples of map sheet titles: Second Army Front Map F, Lone Tree. Examples of 1:10,000 sheet numbers: 36 NE 3, 57B NW 1, 62C SW 4. The system of grid references is used to identify specific locations on printed British military maps. The same grid referencing system is marked on maps at different scales. The grid references are separate from but related to the system of map sheet numbers. If an entry in a war diary includes a grid reference but not a map sheet number, you will need to identify a suitable map before you can make sense of the grid reference. The area covered by each 1:40,000-scale map sheet is divided in large squares, each identified by a capital letter. These large squares are divided into either 30 or 36 smaller squares, each measuring 1000 yards by 1000 yards. The smaller squares are given numbers. The shaded square in the diagram above is R20. Each numbered square is further divided into four squares, each measuring 500 yards by 500 yards. 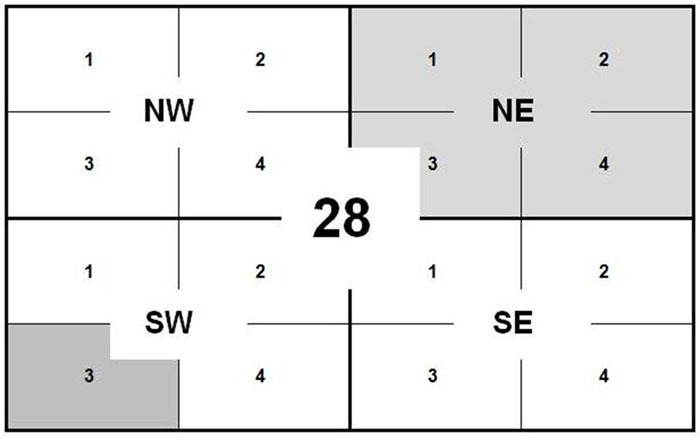 These small squares are identified by the lower-case letters, a, b, c and d. These letters are not normally marked on the maps. The shaded square in the diagram above is R20 b. 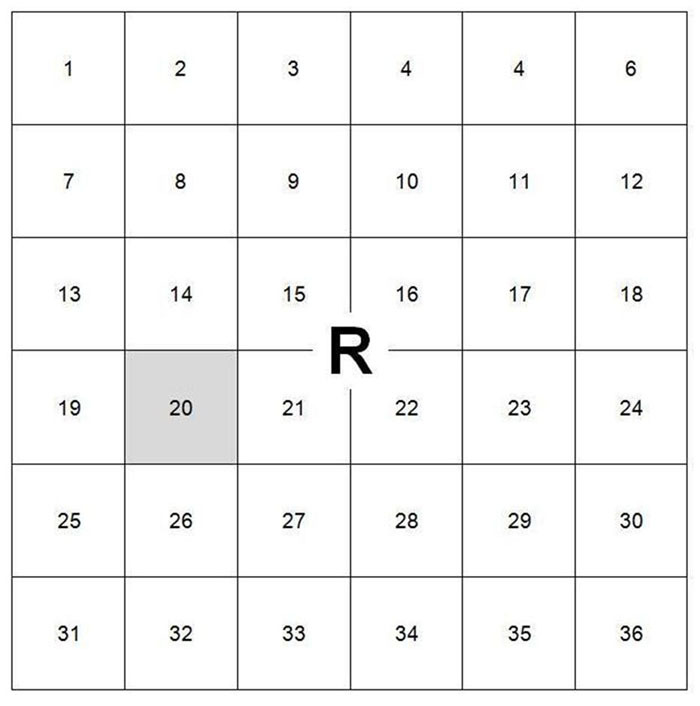 Within these small squares, specific points can be identified by numbers. 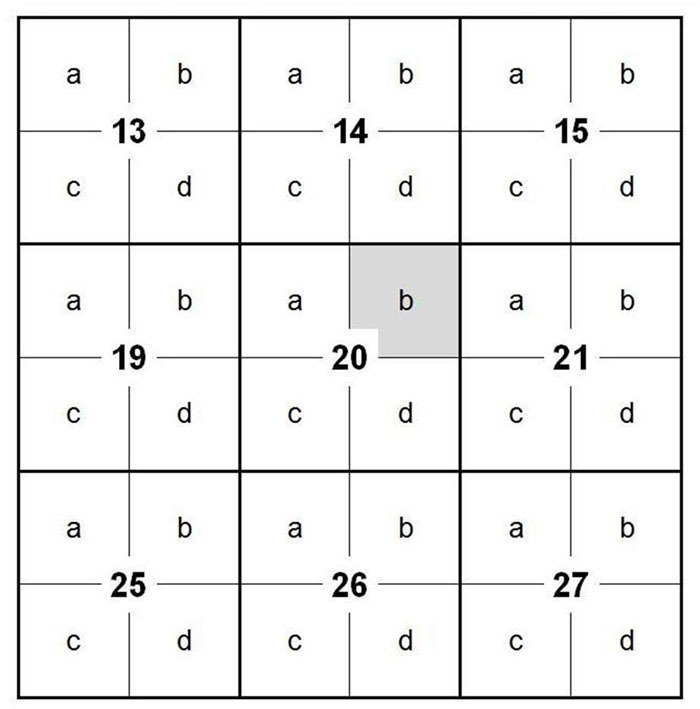 These numbers work by dividing the square into an imaginary 10 by 10 grid. On some of the maps the grid lines are marked out in tenths to make working out grid references easier. The divisions going horizontally west to east are called ‘eastings’. Those going vertically south to north are called ‘northings’. The eastings figure is written first, followed by the northings figure. The two may or may not be separated by a dot. This point is accurate to within an area of 50 yards square. The diagram above shows the location (marked ‘X’) of R 20 b 8.5 on a 1:5,000-scale map. (This is a reduced-size copy of part of a map of St Pierre Divion. Reference WO 297/318). On some 1:5,000-scale maps, points of interest (such as a junction between two trenches) are labelled with partial grid references. Sometimes grid references are made more specific for greater accuracy. If a grid reference ends with four figures instead of two, the first two are the eastings and the remaining two are the northings. This point is accurate to within an area of 5 yards square. Documentation about military surveying during the First World War is available on the Defence Surveyors’ Association website.